“Friends and comrades, the light has gone out of our lives, and there is darkness everywhere, and I do not quite know what to tell you or how to say it. Our beloved leader, the father of the nation, is no more." - Indian Prime Minister Jawaharlal Nehru on the death of Mahatma Gandhi in January 30th 1948. As the chilled weather blanketed India with the fond memories of the most loved Bapu, the world closely looked at his last remains (ashes) in the golden urn that was in its final hours of display. What a way to mark Mahatma Gandhi's 60th death anniversary. Mohandas Karamchand Gandhi, also known as the Mahatma or Great Soul was assassinated by Nathuram Godse as he was walking to his evening prayer at the grounds of Delhi's Birla House. The violent death of a man who steadfastly preached and practiced non-violence, shocked the whole wide world. A political scientist describes the killing as the last 'moral assassination' in South Asia. While the assassinator might have succeeded in taking away his life as punishment for “desecrating mother India", but he failed to kill his powerful legacy which inspired people like, Martin Luther King and Nelson Mandela. Even after 60 years his popularity remains undiminished. Mahatma Gandhi's ashes were returned by a Dubai businessman whose father had kept them for decades. His mortal remains were paid homage before they were scattered over the Arabian Sea this morning in th presence of Governor, the deputy chief minister and other dignitaries. By returning the ashes to the water, the Gandhi family believe they are fulfilling his own wishes that no part of him be kept for eternity. It was believed that all of Mahatma Gandhi's ashes were meant to have been immersed in the river Ganges in 1948. But many of the urns were secreted away by his ardent lover and followers who wished to glorify him in death. The ashes were sent to towns and villages across the country and also abroad for memorial services. But some of them were never returned. In August 2006, Bharat Narayan, a Dubai-based businessman, handed the ashes which had been with his parents since 1948 into the care of Mani Bhavan Gandhi Sangralaya. 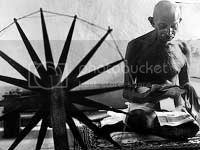 Narayan's parents Madalasaben and Shriman Narayan are stated to have been Mahatma's close associates in the past.